Go ahead and choose an alternative space. A place you have visited or somewhere you have never been, somewhere you want to be or some place you'll never get to see. Now, imagine that at a certain point that “alternative space” is always one and the same. Your space is where you do your “sit back and relax” moments. Time is irrelevant, space is limitted and there are only people and objects that you have invited in. I am here at this cafe. Arl Square or Whichever-square, but always by Van Goh. A man, who (despite being deaf), painted a world full of so many sounds, it becomes difficult to hear everything. But stillness... it is also a different type of silence. 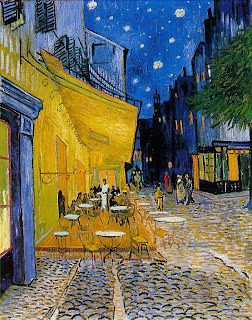 I am sitting at one of those small tables, having red wide under a blue-er sky, where the stars are closer, people never stop coming and going, the night never ends, the day is always around the corner, the paved alley resembles a sea and I can get to anywhere from here. A vision of Cafe-terrace at night. The world exist only in the shades of yellow and blue, in the warm and cool breeze, in the day or at night, in light and darkness, in hope and foolishnes. The alternative space can pop up in our heads at any moment – no mather if you are laying carelessly on the beach or your working your A-S-S off. In the alternative space you can change everything, exept it is always the same season or it's either day or night. At the end, all of us end up exatly where we need to be. The love between you and a city always has a beginning and ellipsis. The chemistry cannot be explained and fills every street and every centimeter. You sense that you have lived here – in the past, present and the future. And that there is always something that awaits to be discovered. The first time I fell in love with a city was with San Diego and all the European cities were like a magnificent desert with a fine chocolate glaze. They can make you smile, once you have taken your dose of them, always with love. But me and London – we met. Sometime during my month of July. And London does know secrets. Thames knows secrets. The rain knows secrets. This is where the whole world resides and still you can feel the scent of Shakespeare, Sherlock Holmes and Oscar Wilde. The bridges connect not only the two sides of the river, but also the past – a past that can never leave with a future that has already come. A self-sufficient city, where nothing is really enough. The city of London in greens, grays, water, light and so full of the unusual. I couldn't play it yesterday, but if I do – no matter how short my performance might be, I know that I will become one with the city for I have left in it a few notes.. I have a little time left to do so... Or maybe I have all the time in the world? She: I had to. Didn't I? He: You didn't have to. He: Yeah, that's true.... So, how are we going to do this? She: I thought you knew. I have never done this before. He: Really? Then you might not like it. The first time is always nasty. She: Like with most “first time”s. He: Well, don't even think about it. Just...do it. Would you like me to go first? He: I don't love you. She: Oh, you're starting with the “heavy” stuff. He: That's the whole point, isn't it. She: Alright, then. I, on the other hand, cannot stop loving you. And I hate it. He: I had imagined others while I was doing it with you. He: I hate the evenings spent with your parents. And I don't really like your father. She: He doesn't like you either. And I don't like your hair. And your stupid leather jacket. And the way you prettent to be a “bad boy”. It's not you. He: I mastrubate every other night. And I am not thinking of you. She: If you did and I knew, I would run away. He: I want people to like me. And to tell me that they like me. She: I wan't you to write me a song. To dedicate something to me. I hate the fact that you hate it that I like all that stuff. He: I just can't do it. And you wouldn't let it go. She: I dream a lot. And I go to bed late. Not enough hours of sleep, but plenty of dreams. If I truly believe that our dreams express all of our secret desires, than I must be mad. And pretty sick too. He: Depends on what you understand under “sick”..
She: You're sick. Because you take everything and then you leave. He: What about you? You don't take anything and you won't leave. So you can rescue. Yourself, mostly. She: I've hit a line of coke. She:: I love the color blue....especially your blue couch...and you and me on top of it. He: And then you take a shower, while you're singing to Beyonce and at the same time I am imagining how you look. And then I go to check if things are really as I imagine them to be. She: I talk to myself. And I remember like an elephant. I remember all the bulshit that I have done and have regrets about it. I live every moment again and again and I think I have created at least 5 different universes. He: Am I in all of them? She: Only in one. Where you are my better half. The perfect better half. She: I don't think so, no... While we keep going broke and surviving of of sandwiches, there is no way for us to get married. He: Because we spend ou money on other things. And we like it. She: I forgot for how long we have been together. It's like you have always been here. He: Somethings you never forget. Riding a bicycle, swimming, the tango, the taste of snow, wet hair on your skin, sand below your feet, how the touch of a naked body feels in the morning and tangled feet under the sheets. It's ok that you have forgotten the time. She: Yeah, especially since it doesn't exist anyway. Or at least it's irrelevant. He: So we have been here for 5 seconds. Lets just say that it has been that long. She: We have said everything for 5 seconds and we won't see eachother again. He: Not phisically. There is no need for us to touch. But you can always call me. Or you can simply remember how happy we have been and it can be good enough. She: And to dream of you. How you're making fun of me for not knowing anything about cars or computers.And because you won't actually be here, I'll trow you under the bed. He: We are already there. She: Are you crazy? Only the Boogeyman lives there. She: My childhood nightmare – a single hand, creeping up from under the bed! Skinny and dry. And all it wants is to grab you! He: Souls are bigger predators than monsters. And they cannot be satisfied.You can beat him. She: Yes, I know. We have to say goodbye right now tho. My soul is hungry for you and I am not used to being this honest. Or saying “goodbye”. She: The only thing I don't get is why are we under the bed? He: Because we are hiding from the world. And I think you're refusing to wake up. C'mon, I'll help you out. Take a deep breath... three... two..
Публикувано от Joan в 4:35 ч.